This is the result of about 8 hours work so far. I’ve made so many mistakes that have had to be corrected, it’s now the fabric equivalent of Frankenstein’s monster. What did you do wrong went wrong? Well first off, as I spoke about in a previous post, I omitted to add the extra width in the bodice to accommodate the darts, so I had to re-cut the bodice fabric and lining. Then, since I had no experience of adding lining to a dress, I decided to sew the lining pieces directly to the fabric pieces by zig-zagging round the edges. I then sewed the back bodice pieces to the bottom skirt and added an invisible zipper. So far, so not so bad, although the invisible zipper was pretty tricky and the finished result wasn’t amazing but it did the job. Then I sewed the front bodice to the front skirt. Guess what? It was STILL a few centimetres maybe too narrow. Where am I going wrong with this, I thought? *%&@ it – I’ll just sew a larger seam allowance down the sides. Then I attempted my peter pan collar. I had decided to sew it in between the lining and the fabric so a nice crisp clean collar would emerge like a pretty little butterfly when I turned it. Uh-oh – I’ve already sewn the bodice to the skirt so I can’t do that. Stupid. OK – I’ll sew it onto the neck line instead. Eurgh. Not a good look on the inside on the dress. But lesson learned for next time. NO! The zip fastener flew right off the end of the zip when I pulled it up! How could I be so dumb? How on earth did this happen? What compelled me to carry out such a foolish act of stupidity? Cue another half hour sobbing on the couch unpicking a 20 inch zip in the last of the day’s light with concerned cats and husband watching from the corner of their eyes. So this is it for the time being. One peter pan collar done, one left to do. Two sleeves to set in (boy I can’t wait to do that! not…), one invisible zipper to re do, side seams to stitch up. I still suspect that it’s going to be a few centimetres too narrow for me. But I’m going to finish this dress. It will not break me! Well sewing peeps, I’m afraid there is little to report from the sewing room this week. Mostly because I spent the weekend at ATP’s I’ll Be Your Mirror at Alexandra Palace, and spent the following two days recovering… I’m too old for this palaver you know. Highlights from the festival (ooh too many to mention but I’ll give it a go) included a storming performance from PJ Harvey who looked like some fabulous medieval folk witch, an extremely noisy set from Liars (have you ever felt a drum beat reverberate in your belly? I can safely say I have now…) plus dreamy schwoozy indie pop from Beachhouse. But I digress. Back to sewing. 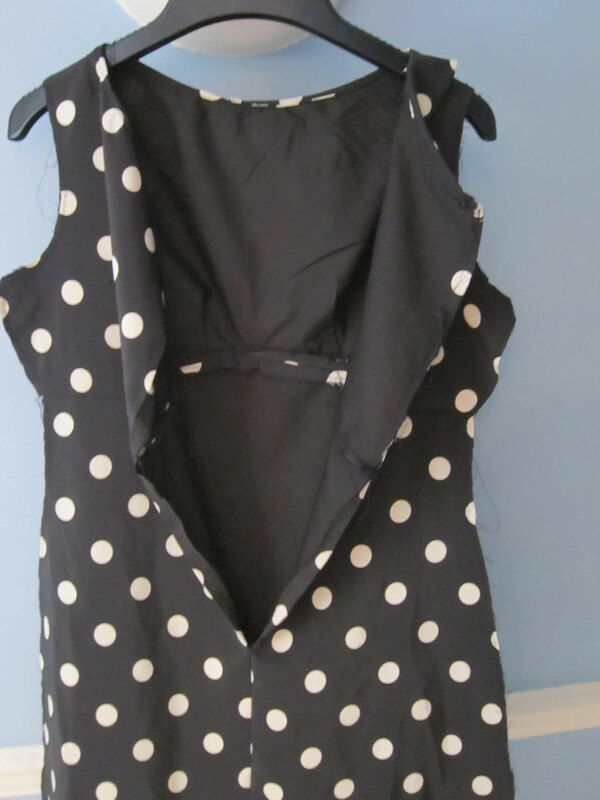 I did manage to get some more work in on my cloned polka-dot dress on Sunday morning but found that whilst I’d traced my darts correctly (bravo) I’d failed to add the necessary extra four cms to the width (for shame). And I’d already cut out my bodice material and lining. Oh the waste. But I have plenty of spare fabric left so will just have to do it again. Or lose a rib or two. And maybe a lung. I’ve said it before and I’ll say it again – this is going to be a sloooow project as I’m so nervous of making clothes. I don’t know why. I can approach a cushion or a tote bag fairly confidently now but I’ve still got the ‘dress stress’. Anyone else get that feeling? Excitement, apprehension, quaking fingers, a sense of impending doom and failure? Or is it just me? So in the absence of a completed made-from-scratch project to show you, I just thought I’d share some ‘easy’ upcycling jobbies I’ve been doing on my wardrobe. Much less stressful than creating something from scratch and so nice being able to get more use out of things you never thought you’d wear again. This was a very fine dress from Monsoon, bought for the ballet a few years ago and never worn since. It was just that wee bit too long and formal for work or play. All I did was raise the hemline by about, ooh, seven inches or so and added a bit of rick rack to the bottom. Now it’s just a pretty little dress I can wear anytime. This is one of my favourite upcycling projects. I bought the cardy from a charity shop in Muswell Hill for £6 (I know – steep for a charideee shop but hey it’s Muswell Hill dahling) as I wanted to do some serious cutting. Inspired by Casey’s tutorial on reshaping knitwear I made the long sleeves ¾ length and added a vintage lace trim round the cuffs and edges. I love this cardy so much I’m in danger of over-wearing it. So sorry I haven’t got the before pic for you but I’m sure I’ll be tempted to do it again, perhaps to a scarlet version. I would definitely recommend giving it a go if you have some old knitwear lurking in the back of your wardrobe. 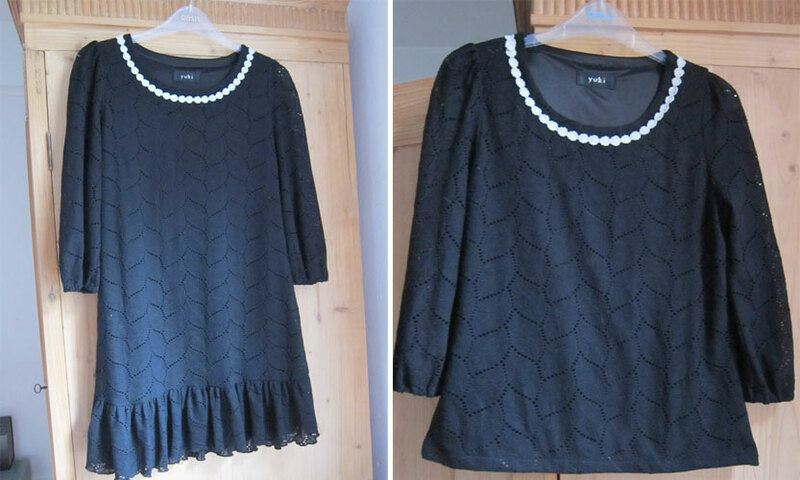 Finally, this dress was worn just twice and never again – the frill felt a tad too girly for me. So I chopped off the bottom and did a rolled hem. Now it’s a cute and perky jumper – perfect for autumn (or July, considering the London weather recently). I had to forcibly restrain myself from adding more rick rack though. That stuff is addictive. Word. What about you? Any upcycling gems you want to share? Or do you have any tips for the dreaded ‘dress stress’? I could do with some reassurance that it’s not just me. The news coming out of Norway over the last 24 hours has been tragic and shocking in equal measure. I’ve been lucky enough to visit Norway a few times over the last couple of years and have good friends living in Trondheim. Norwegians are a fantastic race of people. They’re tolerant, practical, forward-thinking, creative, responsible, thoughtful and funny. Most of all though, they’re incredibly proud of their young people and invest a lot of care and love into the next generation. So for this terrible act to happen to the very group of people that Norwegians place above all else is even more heart-breaking. Marit, Simon, Freya, Ragna, Jan, Vebjorg, Adrian, Johanne, Marit, Elin and family – we’re thinking of you and your country this weekend. Bag! I managed to finish my For Pleat’s Sake tote bag project on Friday night. I was desperate to get it finished, not least because sewing is OUT this weekend as I’m off to ATP festival at Ally Pally all day Saturday and Sunday so there’s no way I could get to do a bit of stitching until next week. Am completely chuffed with this bag. It’s the first one I’ve made that I’ll be glad to wear out (and not slightly apologetic about). I hope it looks fairly professional. I think it does. It was pretty easy to make on the whole, although sewing down the ‘v’ sides was a bit tricky as a first timer – I over estimated how far I needed to go and had to get out the ol’ trusty seam ripper. We’re now fully acquainted – the seam ripper and I. I’m pretty sure I use it every time I sew. I’m going to call her Harper 7. I love the handles. 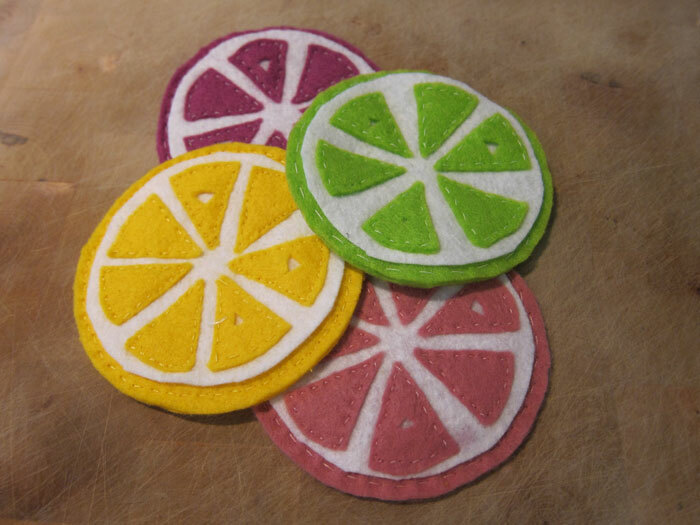 They were super-easy to sew on with a bit of leftover embroidery thread. And another exciting addition – I ordered some woven labels to sew into items that I made for gifts for family and friends, initially as a bit of a joke but I got steadily more and more excited when I thought about them. They arrived on Friday! I want to put them on everything, all of the time. So I sewed one in. I really need to work on my technique for though – look at the state of that?! Any tips? 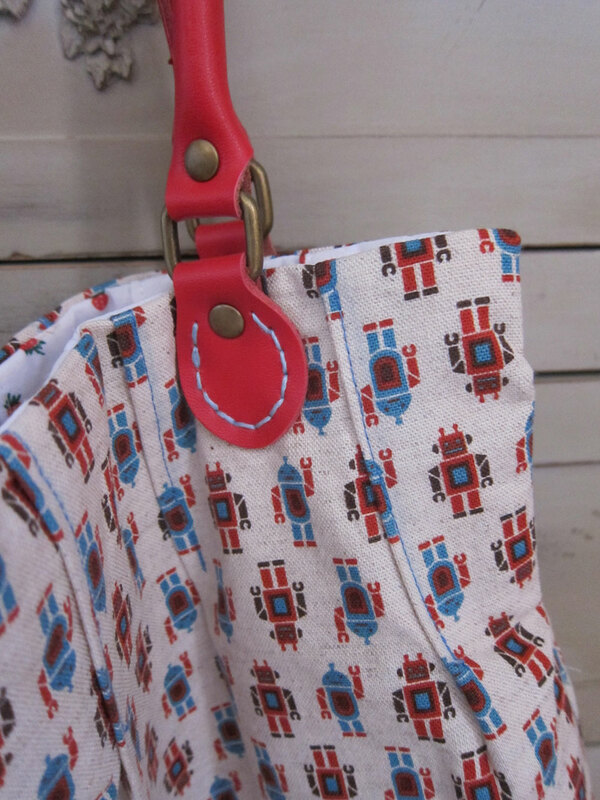 Loving the robot print. I have a bit of a fetish for songs about robots. You might have noticed the small and not very clever reference to Marina & the Diamonds in the title, but I think this bag has Robyn & Royksopp’s The Girl and the Robot written all over it, which is one of my all-time favourite pop songs. 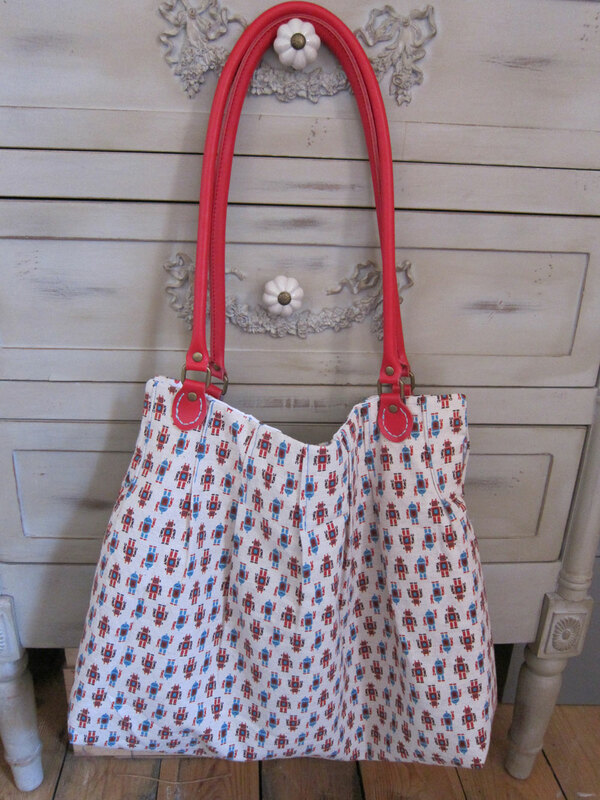 If you fancy making this bag too, the full tutorial is available for free from the fabulous Lisa Lam on u-Handbag. Just so you know I’m not slacking in my resolution to make at least one new item a week, I thought it was time to introduce a mid-weekly sewing room update on whatever projects I’ve got on the go at the moment. It’s so nice to have multiple things in various stages but it can also seem like you’ll never finish anything. So this will keep me focused and motivated (or harassed and impatient – depending on the weather/availability of chocolate/red wine etc). 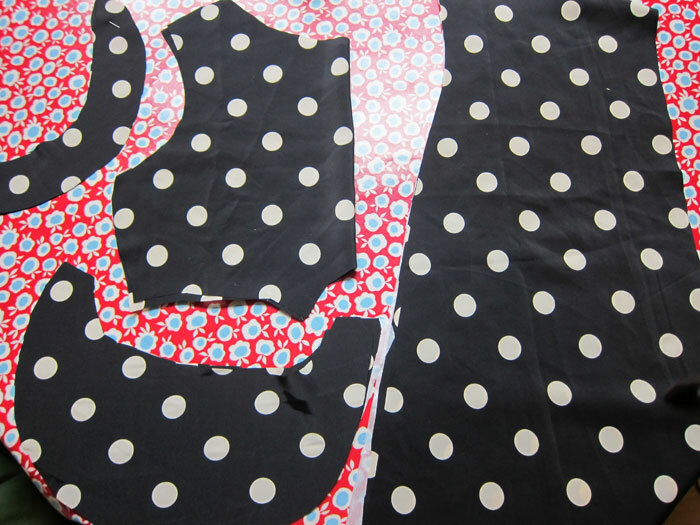 Putting in the groundwork for a new dress, using my cloned pattern from the Oh Sew Brixton! workshop I did on Sunday. 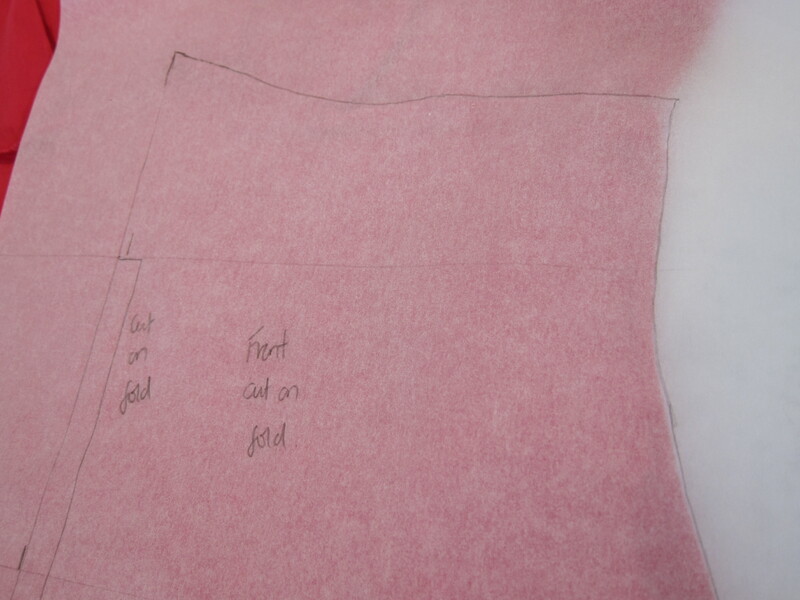 I’ve transferred the pattern to a sturdier paper and I’ve cut out my dress fabric. 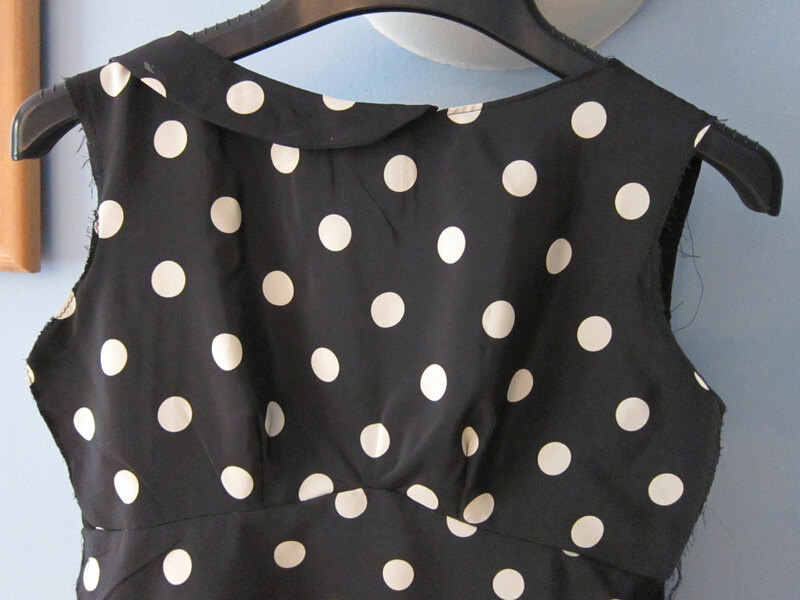 I’m using some leftover black with white polka-dot polyester satin (at least I think it’s polyester satin – my fabric knowledge is rubbish but I’m trying to improve it) that I bought at Walthamstow market for a couple of quid a few years ago. I want to try the pattern out on a cheap fabric before I go doolally in the shops. I’ve got a black cotton poplin for the lining which I’ve yet to cut out. I’m going to take this project sloooooow as it’s the first dress I’ve made in years and only the second ever unless you count tracing round a tunic, cutting it out, sewing it together and ignoring all shaping whatsoever. 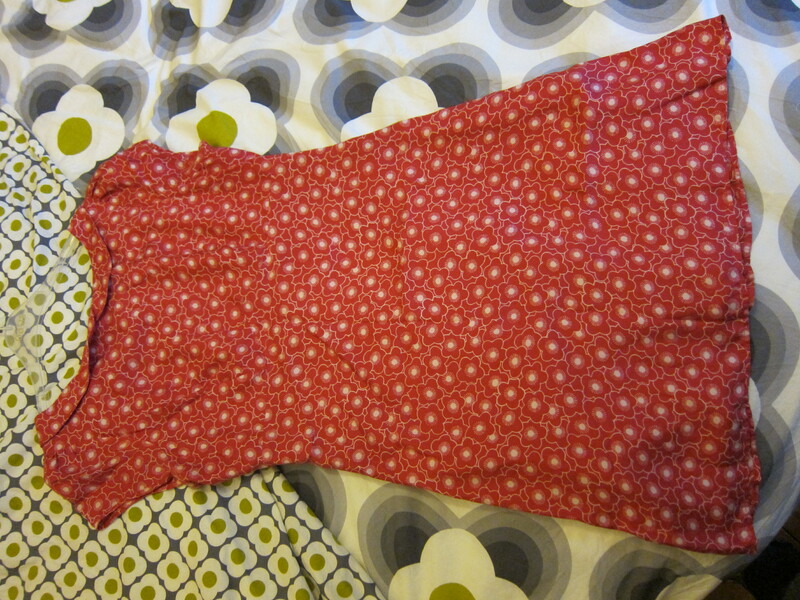 Oh and the baby dress – but that doesn’t count as I couldn’t fit into it. 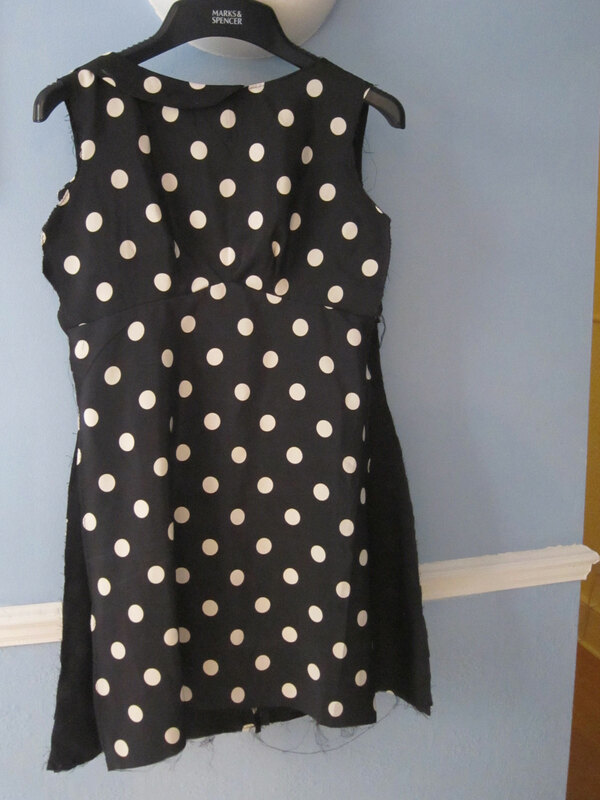 I actually have metres and metres of this polka dot so I want to try my hand at making a circle skirt from it as well, using these fantastic directions from Andrea Tung. I’m really excited about this one, mostly because I used to have a scarlet circle skirt that I loved and stupidly threw out when I gained a bit of weight around the middle. Oh the shame and waste! I’ve also still got my wedding crinoline (a lovely champagne colour) which I think would look very sweet peeking out from under those polka dots. Tonight I’ll be starting on this pretty ‘For pleats sake’ tote bag (yes – another free pattern. How generous are web sewists? It’s awesome) from Lisa Lam at u-handbag. 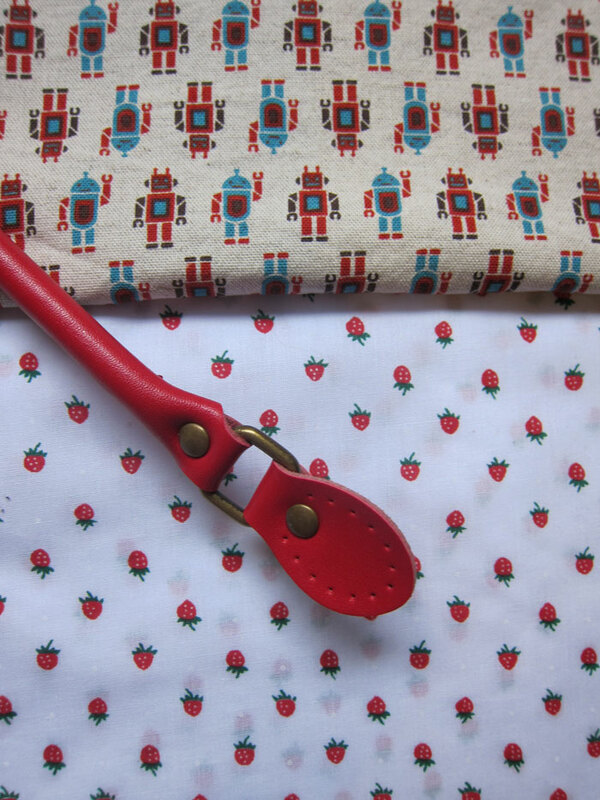 I actually have a very similar robot print so I’ll be teaming that up with the leftover strawberry cotton from my recent apron tutorial. I even got the same red leather handles from eBay. Hope to get this finished before the week is out. And finally, when I have a moment, I’m continuing to add to my collection of felt coasters as it’s so nice having a bit of time away from the sewing machine, just watching a bit of telly and knocking one together. I made two just watching The Hour last night. (BTW did you enjoy it? Started a bit slow but picked up the pace for me – really enjoyed the period detail and love Ben Whishaw’s angsty angry journo – yikes he’s hot). So that’s it from The Sewing Room this week. What about you? Any projects on the go? Have you ever had an item of clothing in your wardrobe that you love, love, love and even though it’s battered and ripped, you just can’t bear to part with it? Have you looked at this item and thought ‘If only I had bought ten of these then I could wear it forever…’? I certainly have,and that’s why I went to a fantastic Wardrobe Cloning workshop at Oh Sew Brixton! on Sunday afternoon. 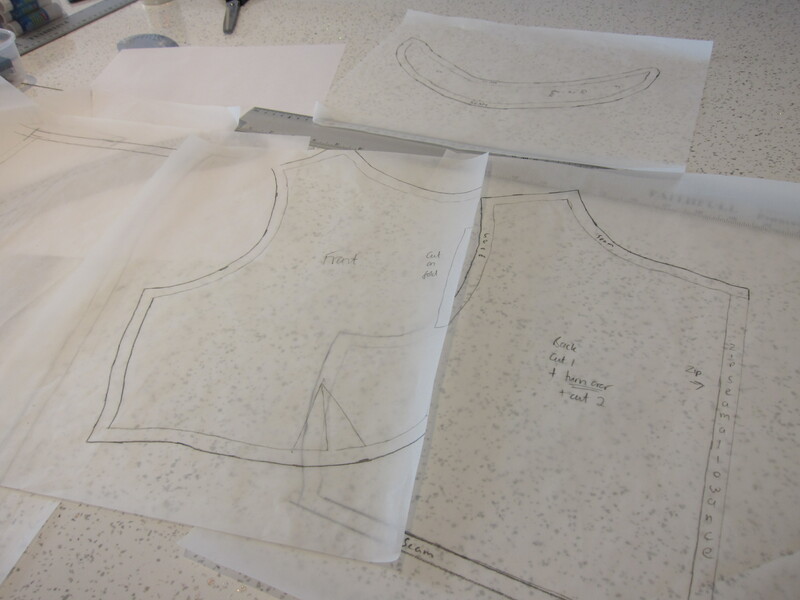 As the rain hammered down on the skylight and the thunder and lightning lit up the London sky, eight of us were busily rummaging through our wardrobe ‘can’t-bear-to-part-withs’ with our tutor Yolanda, tracing outlines and seams, darts and zips onto greaseproof paper. As the name suggests, the Wardrobe Cloning workshop teaches you how to create a dressmaking pattern from your favourite items so you can recreate them again and again. We brought a few items each but the work was so intensive most of us got through just one garment. I brought this dress I bought years ago from Warehouse. I love it. I’ve worn it a million times and always get a compliment whenever I do. It fits perfectly. But it’s getting old. Alas, wearing and washing have taken their toll and now I can only wear it with a long cardy to hide the various little rips and holes. I’ve had it recreated by the tailors of Vietnam, but in fabric so hideous I couldn’t bear to wear it. (I was on holiday! I had sunstroke! I was drunk at the time!) So I decided to take matters into my own hands. First Yolanda talked us through the piecing of a garment and how to notice the shape and drape of it, taking notes of darts, zips and curves to the outline as well as the feel of the fabric. In essence – what makes us love the item and what we want to recreate in the pattern. Then it’s down to work. 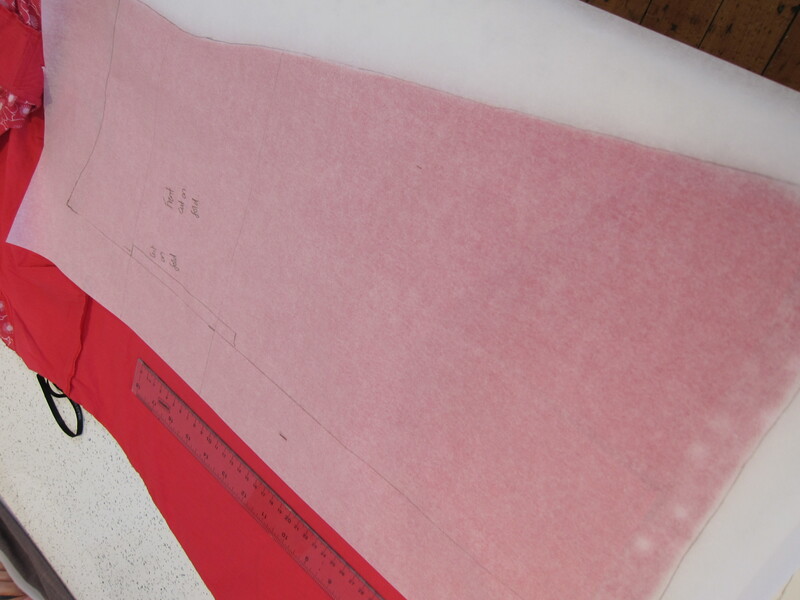 Laying greaseproof paper over our items we traced every dart and seam, measuring, measuring and measuring again.The bodice was fairly easy on my dress, but trying to get my back and front skirt to line up together was tricky. Garments change shape over time with wear and tear so it’s a matter of straightening up, second guessing and a little bit of alchemy, as Yolanda put it. The three hours whizzed by and many of us were just finishing up at 5pm on our first piece. I can’t wait to make this dress. I think putting the pattern together myself takes a huge chunk of fear out of making it. I understand the pattern perfectly – because I created it. I’m still going to make it out of cheap fabric first though – I’m not that confident yet. 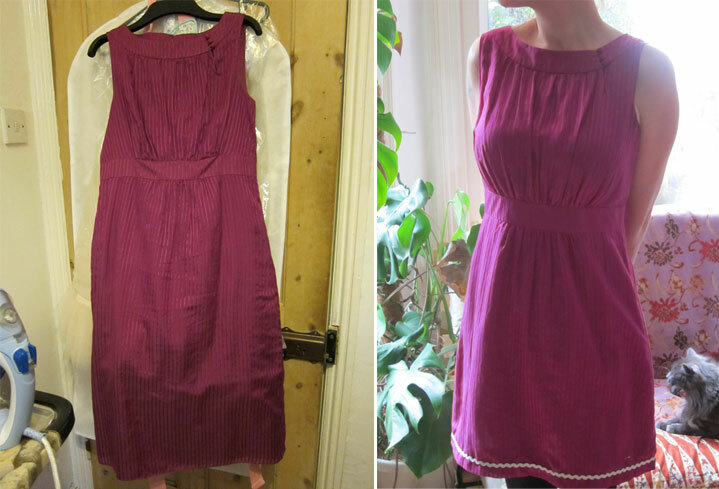 Wardrobe Cloning is just one of the many workshops that Oh Sew Brixton! offers, but if you’re interested then get booking for the Sat 20th August class from 2-5pm. Costs £35 which is a bargain in my book if you consider how many clothes you can re-create as a result of the skills you’ve learned. Just think what you can do – charity shop finds in awful fabrics can become templates for glorious new items. Love a friend’s dress but can’t get it anymore? Trace it and make it yourself! Though before I get carried away on a reverie of the possible – I need to get down to the practical… and make the darn thing first. Watch this space for further updates. What about you? If you could clone one thing from your wardrobe – what would it be? Isn’t this cute? Would make a great dress for a little girl, or an unusual vintage blouse, or even the centre piece of a log cabin quilted cushion. This is dreamy. It’s cherry blossoms on top and traditional asanoha stars on bottom layer so completely reversible. 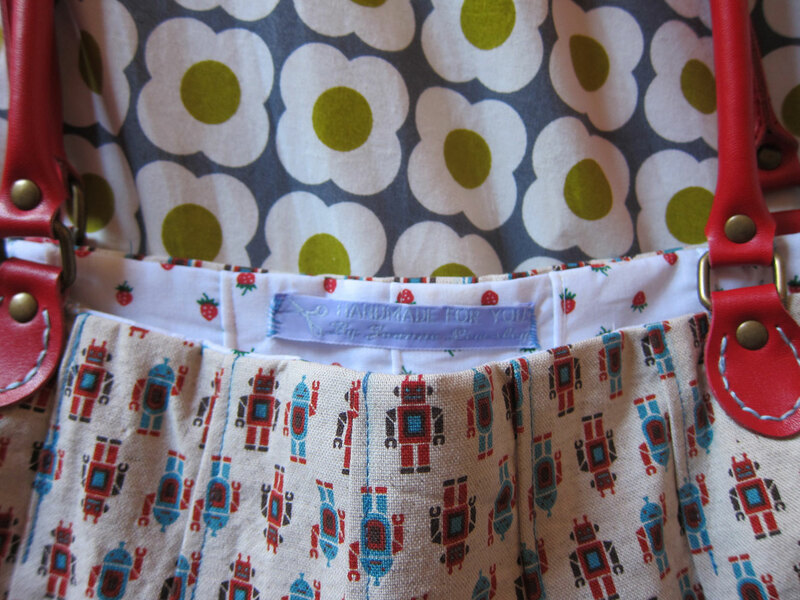 I have a forthcoming project to knock up a pair of Colette Bloomers so it might be perfect for that, though reversible knickers might be a bit forward thinking. Perhaps a pyjama set or a retro ‘Some Mother’s Do ‘Ave ‘Em’ dressing gown? Betty (Spencer – not Draper) is grossly underrated as a style icon you know. Finally, my favourite. Look at the grain on it! I’m thinking of using this for a dress project – either Simplicity 3836 which Nibbles and Bytes has done a stunning version of. I guess which one I choose depends on the drape and feel of the cotton. Exciting though. Now I just have to wait for it to be delivered. Ooh the anticipation! Later today I’m off to a Wardrobe Cloning Workshop at Oh Sew Brixton. I’m bringing two dresses to clone. No sewing – just pattern making today. Hopefully I’ll have something to share later this week! What about you? Any fantastic sewing courses to recommend?